Form 0007 or the "Application Form For Veteran's Preference" is a form issued by the Florida Department of Veterans’ Affairs. The form was last revised in December 1, 2015 and is available for digital filing. 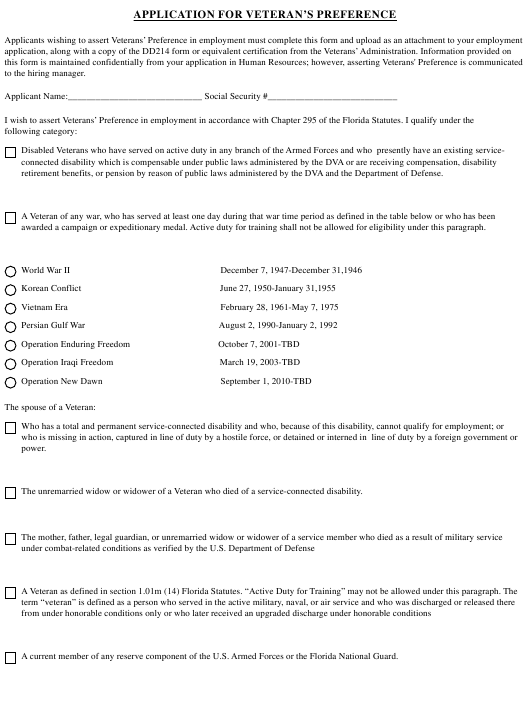 Download an up-to-date fillable Form 0007 in PDF-format down below or look it up on the Florida Department of Veterans’ Affairs Forms website. retirement benefits, or pension by reason of public laws administered by the DVA and the Department of Defense. awarded a campaign or expeditionary medal. Active duty for training shall not be allowed for eligibility under this paragraph. A current member of any reserve component of the U.S. Armed Forces or the Florida National Guard. Division at 407-665-7944, 1101 East First Street, Sanford, Fl 32771.
received notice that you were not selected for the position. If a notice of hiring decision is not given, a complaint may be filed at any time.